Clean the World is an Orlando-based social enterprise bringing the hottest new funding mechanism to Central Florida. As entrepreneurs and businesses struggle for capital to grow, non-profit Clean the World has launched a funding campaign on RocketHub to further automate their operation and dramatically increase output of recycled soap going to families across the U.S. and kids in 55 countries. They do this to combat the daily deaths of 9,000 children worldwide from hygienic-related diseases. Clean the World is at the front of the non-profit pack, using crowdfunding to support its mission. The RocketHub campaign goal is $54,000 and has a tiered rewards system for people who give – or fuel – as RocketHub terms it. The process is user-friendly, allowing “fuelers” to do so online in less than five minutes. 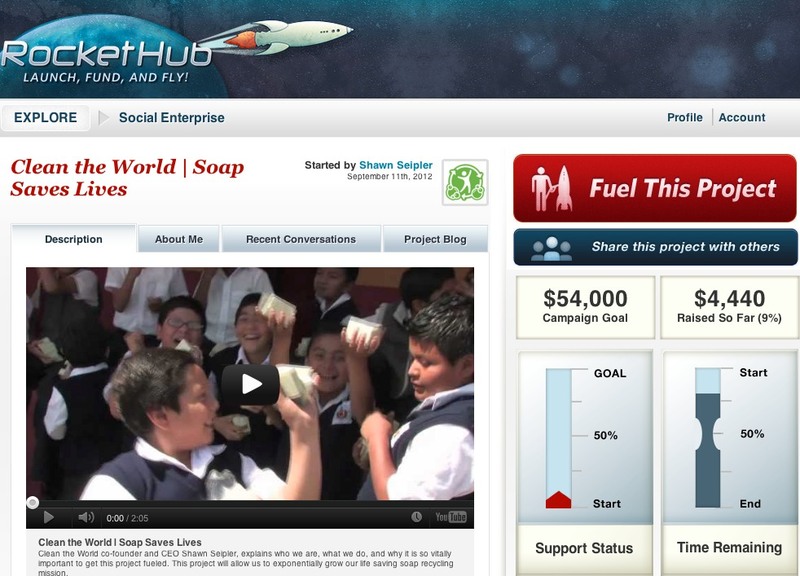 To fuel Clean the World, go to www.cleantheworld.org/fuel and click on Soap Saves Lives. RocketHub is one of the top three crowdfunding sites and has helped grow this new funding market from $33M to $128M in the last two years. Crowdfunding is expected to be a $1B market by 2014, enabling growth for businesses challenged by limited access to capital. Brian Meece, CEO of RocketHub, will be one of the featured speakers at The B.I.G. Summit hosted by Orlando, Inc. on November 8, 2012. The B.I.G. Summit is a premier event for Business Innovation and Growth, attracting entrepreneurs and business leaders from across Central Florida. Orlando, Inc. President Leslie Hielema comments, “The 2012 B.I.G. Summit is focused on connecting entrepreneurs, peer learning and breakthrough thinking that drive business innovation and growth. Capital for growth, including crowdfunding, will be one of several issues addressed by our expert lineup of speakers. If you want to grow and fund your business, don’t miss this event.” Registration and information is available at www.orlando.org/big. About Clean the World Foundation, Inc.
Clean the World Foundation Inc. is a 501 (c) (3) charitable organization. The Foundation executes its mission of saving millions of lives around the globe by leading a global hygiene revolution to distribute recycled soap and hygiene products to children and families suffering from high death rates due to the top two killers of children worldwide – acute respiratory infection (pneumonia) and diarrheal diseases (cholera). In 3 years, Clean the World has distributed more than 11 million bars of soap to children and families in 55 countries worldwide, simultaneously diverting over 750 tons of waste from North American landfills. For more information visit: www.cleantheworld.org. Follow us on Facebook and Twitter for more updates on how you can help save lives with soap.